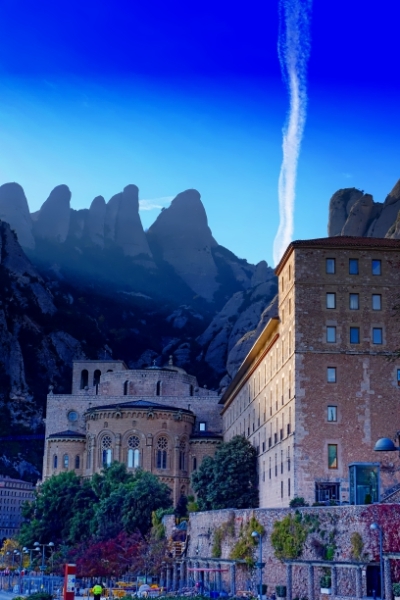 5 days in Barcelona and Montserrat | Where in the world is Grandma? Our taxi arrived promptly at 7 am and we headed for the airport. The beauty of European travel is cheap flights if you book far enough in advance. We’d paid about $25 (CAN) each for a flight to Barcelona from Santiago, where we’d just finished a two week camino (part 1) from Porto (part 2) Ryan Air isn’t as bad as I’ve heard. In fact, their carry on luggage policy is pretty generous. We had no issues. Our cab driver found our airbnb easily and a kind man rang some bell to get the lady to let us in. Our third floor apartment was nice and suited our needs just fine. It even boasted a nice kitchen which we used a few times to make a meal AND a washing machine! The location turned out to be pretty great too. It was a 15 minute walk to the square, Las Ramblas and the old section, 5 minutes to the subway and about 20 minutes to the beach. For lunch we happened upon a diner that made empanadas which were REALLY tasty. Then we set off to find the walking tour and only got a little lost trying to find the starting point. We toured the Gothic area. The location is great and very interesting but we could have done with a lot less of a history lesson and more about the general area and population. We managed to get really lost trying to get back which meant we saw much more of Barcelona than intended. Getting lost is never a waste as we ended up getting bus hopper tickets for the next two days. The next day we easily found where we were supposed to catch the bus but our sales lady neglected to give us some important information. What does the bus STOP look like? There are several different ones. WE tried to flag the bus down but the driver pointed down the street so we ran for it. That’s when we found the correct post with CITY BUS TOUR and the number on it. We took the green line all the way around before deciding which stops to get off. Getting OFF the bus is the easy part. Finding it back again? Not so much. We decided to go round once more as some of the sites were supposed to better all lit up. There’s a red, cone-shaped, weird building, a fish and some of the Gaudi buildings that were supposed to be lit. Nope. The Sagrada Familia was nice but since no one was getting on or off, the driver sped off and we didn’t get any decent pictures. It was late. We were tired and very hungry so just went to a restaurant close our our airbnb. Paella was on the menu so why not? Big mistake. It was edible but we’d have been better off buying a prepackaged thing at the grocery store for 1/4 of the price. We’ll have to try it again at a better restaurant. The next day we did the hop on / hop off bus with the orange route which visits the west side of Barcelona. That went much more smoothly. Again we did the whole route from the best seat on the upper deck front which you can get when you’re the first ones on the bus. The second time around we got off at various stops and walked about visiting places that interested us. Dragons all over the place. People of Barcelona. Lots of characters! Stop 12 gets you close to the Estanya train station where we bought tickets for Montserrat. 20.50 euro return, including the cable car up the mountain is a much better deal than paying 55 eu for a tour AND we can stay as long as we want. This time we found someone helpful at a tourist information booth. She also gave us info on a bus to get back to the airport. After a full day we walked down La Rambla street and checked various places for dinner. We decided on the Pita House as they had a good deal on. 2 tapas each and paella for 9.95. It was GOOD! Real paella this time, seasoned nicely (not just salty) and with lots of different seafood. On the way home we found a market and stocked up on fruit. Pomegranate, passion fruit, mango, raspberries….we’re in heaven!! On Friday we tackled the metro. That was fun. You can share metro tickets here so we purchased a package of 10 for 9.95, much cheaper than the 2.30 each. 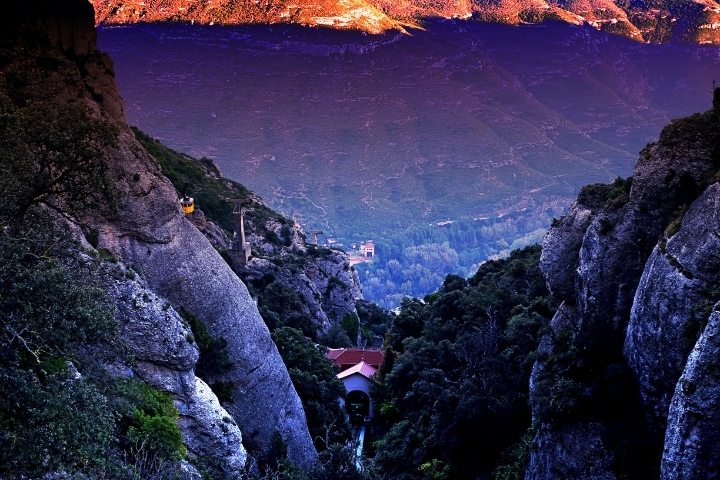 We took the L3 to Estanya and then found the R5 to Montserrat where we took the cable car up the mountain. The funiculars were down for maintenance, a downside to low season travel but at least we didn’t have to deal with crowds. It was busy enough. I can’t imagine what it’s like during tourist season! The boy’s choir in the Basilica was a nice treat so don’t miss it. That’s another thing that would be difficult to see when the place is packed with tourists as the church was full even now. Our ride home was not without hitches but we made it and got off the L3 on Las Rambles so we could find a nice restaurant for dinner. It wasn’t great. I don’t know if it’s because we chose the “deal” or if the food is really not all that great. Saturday was a free day where we just wandered the Raval section for a while, stopped for a coffee and croissant, wandered the Gothic section and the Jewish quarter and enjoyed a gelato. It was finally warm enough for ice cream! None of us felt like taking another walking tour as the last couple had soured us on them. Too much standing and listening to lectures and not enough walking and seeing. I think we managed to see most of it on our own with a map. Dinner was at a restaurant across the street from our room at a place called “Somewhere”. It was the best meal we’d had in Barcelona. I had an amazing salad which was awesome as I’d been missing vegetables. There’s nothing that broadens one’s understanding than to travel and experience different cultures. You might not know where Grama is but she eventually shows up at home. Pingback: Beautiful Granada, Spain and the Alhambra | Where in the world is Grandma?